in a Basic Yoga Class Setting"
"Yoga for MS and Related Conditions is an excellent and highly recommended exercise video. This non-aerobic, complete workout... includes exercises, stretches, and proper breathing techniques. A 10-minute relaxation segment at the end is absolutely hypnotic and calming and could be used by anyone after a stressful day. The back exercises are especially good for anyone with back problems. All in all, an exceptional video!" Who is this tape for? If aerobics videos are too difficult, but you know that you need to exercise - This is the tape for you! No. All you will need is a sofa, couch or chair and a terrycloth bathrobe belt or similar length strap for leg stretches. It is designed to be used at home, alone. But, variations using an assistant are included. Yes. Included is a Doctors Checklist with drawings of each exercise to show your doctor for approval before you begin this program. It also has helpful hints for each exercise. Yoga for MS and Related Conditions is used by doctors, therapists, and hospitals around the country. 48 minutes long, which includes a 10 minute relaxation at the end. "In May of 1985 I was diagnosed with MS but looking back at unexplained symptoms, I have had it since 1979. In 1994 I attended a yoga class and immediately started to see positive results in movement and increased energy. My yoga instructor encouraged me to become an instructor and I agreed as long as I could teach only others with disabilities. She, of course, was thrilled and I completed the course and internship hours. I now teach at a center designed specifically for persons with disabilities in Houston, Texas, and my students all see the benefits of yoga. In August of 2002 I was involved in an automobile accident and broke my hand in four places and injured my arm, shoulder and neck. Having Shoosh's tape "Yoga for MS and Related Conditions: Pathways Exercise Video for People with Limited Mobility" was a godsend because I was unable to teach for months but my body still craved stretching. This video is so well thought out and she has modified yoga postures perfectly for those with physical limits. The MSAA (MS Association of America) has recently given me a grant to purchase these tapes for my students who also love Shoosh's routine. Thank you, Shoosh, for your wonderful work! " "One of the best exercise videos for people with M.S." "Excellent for patients and families." 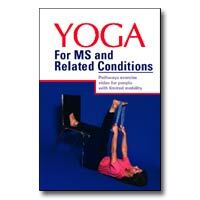 "Yoga for MS and Related Conditions is a wonderful addition to any therapist's professional library." "An excellent program for senior adults and others who want to maintain a healthy level of fitness." Dr. Sonja S. Glassmeyer, Certified Gerontologist, Professor of Physical Education, Cal Poly, San Luis Obispo.